Dunedin is a little like being in Scotland ... well, that is except that here there are fabulous Fur Seals and gorgeous penguins that happen to live on the coast of beautiful Otago Peninsula. I have to admit when we arrived here I wondered why on earth we were visiting here. However, a trip around the gorgeous peninsula to Nature's World - on Valentine's Day of all days - and a vist to see the Fur Seals and their pups as well as blue-eyed and yellow-haired penguins made the trip definitely worthwhile. I completely fell in love with seal pups and have no doubt my nieces, nephews and godchildren back home would have loved them! 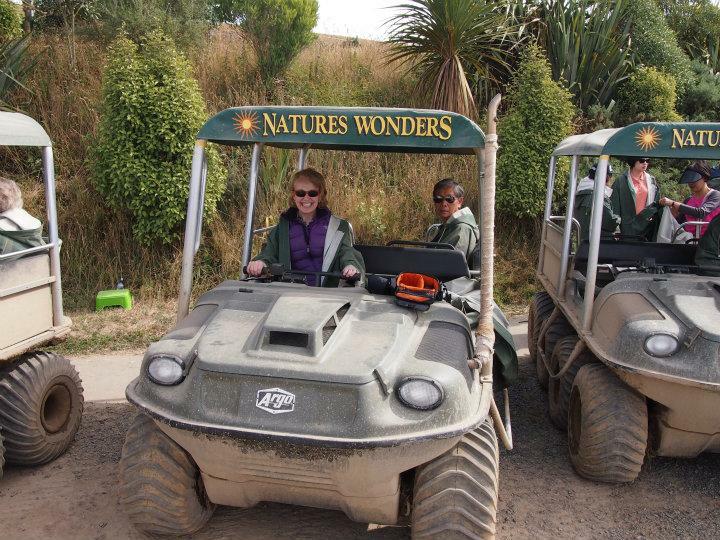 The fact that the trip involved sitting in an 'army-like' vehicle and darting around some pretty steep and sandy tracks made the experience all the more special. We did get pretty dirty but it was great fun! The other big attraction in Dunedin has to be the fabulous Art Decor station which you must visit if you come here. Quite stunning! We were fortunate enough to take two train journeys from here. I'm can't say I'm a big fan of trains - probably I've just spent too much time commuting - but as we travelled along the narrow gauge railway track we really were treated to some stunning views that we would not have had access to via any other form of transport.